Founders are a unique breed. Driven entirely off their own motivation, and super passionate. A friend told me years ago that some founders relentlessly focus on their vision and accept no feedback; while others seek out lots of feedback and change course every time they hear a different opinion; but that the best founders are the ones who take in all the advice, process it and act on what makes the most sense. 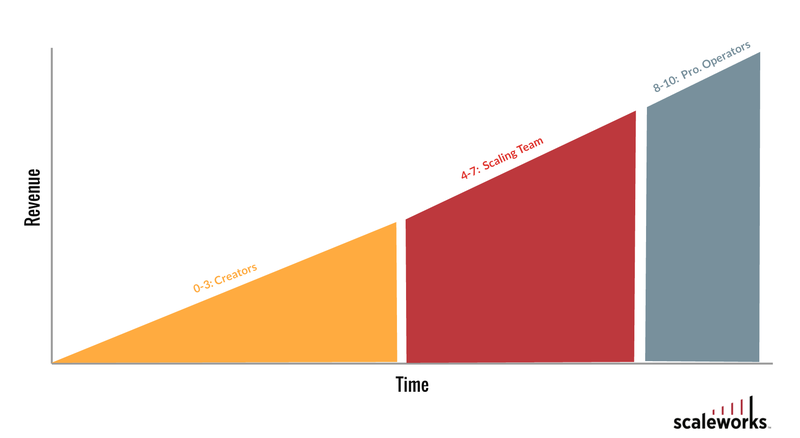 When founders struggle, it’s often because of their passion to build products which ends up being at the expense of focusing on scaling operations. VC’s love to back technical founders, but it’s a rare engineer who’s a good product builder and also a good business builder. I think of the business lifecycle as stages of momentum. At the beginning you have a founder with an idea and the passion to create. Through force of will they build a prototype, raise some money, hire a small team, get a few customers and try everything to get the flywheel spinning. Lots of businesses never make it past the starting blocks — they never achieve any meaningful revenue or traction. I don’t know the exact number but anecdotally it seems to be around half of funded startups. Then there’s the small number that gain the exponential growth of accelerating momentum, and build a successful business. This is about 10–20% (success meaning they deliver returns to all shareholders over-time). That leaves quite a few companies in the middle (somewhere around 30%) that have some traction and revenue, albeit small and with low-growth, a base of loyal customers and positive reviews, and proven product-market fit. At Scaleworks, we think a lot of these businesses have solid potential given time and a fresh and more go-to-market focused team. 0–3: Creation. Going from idea to product, hiring the initial team, bringing on early customers and starting to generate revenue. Lots of companies never make it to 3 or beyond. 4–7: Scaling. Taking proven product market fit and building an operation that increases momentum, focusses on iterating the product and strategy, and is extremely go-to-market oriented. 8–10: Optimizing: Growing into or bringing on professional management that can optimize all areas of the business, that know how to run a large business, deliver profitability and manage stakeholder interests. It’s funny how personal dispositions frame your view of what’s easy and what’s hard — I think going from 0–3 is an extraordinary feat of willpower, and that going from 4–7 is more systematizable and generally enjoyable and rewarding! The scaling stage is about focusing on the customer, sales and marketing, being operationally effective while also spending lots of time iterating on the strategic plan for the company. It’s easier to do this this with a company that already has product-market fit and accelerate its momentum, as oppose to trying to generate momentum. The hardest things in startups are making sure there’s enough cash to pay the bills, and being able to get fast customer feedback to validate if you’re on the right track. Most companies have no customers when they start, and that means they also have no revenue — so every dollar is a cost to be paid from funds raised. With a revenue generating product you have the great benefit of near real-time feedback, and cash flow to at least fund operations (probably not growth, but keeping the lights on shouldn’t cost more than the company makes). For the record, I think going beyond 7/10 requires another set of skills, the more typical ‘professional CEO’ and focus on operational efficiency. I think you’re either a founder, scaler, or operator — its really rare to be all three. Scaleworks is firmly rooted in scaling: taking proven products and turning them into high-growth businesses.